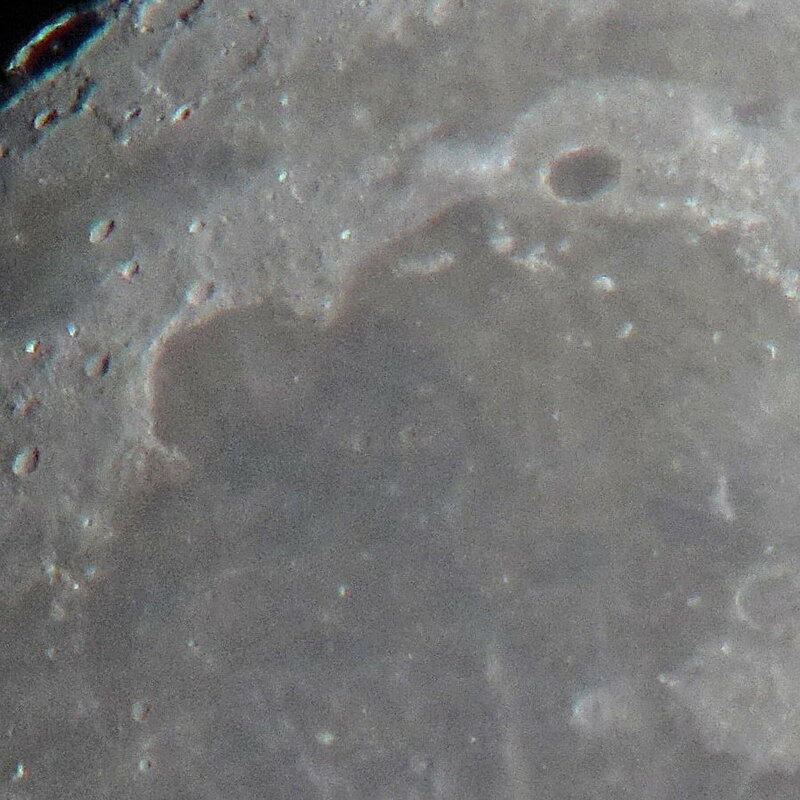 On this page I present photos of the moon that I took on November 16-18 and 20, 2018 and that I edited afterwards. 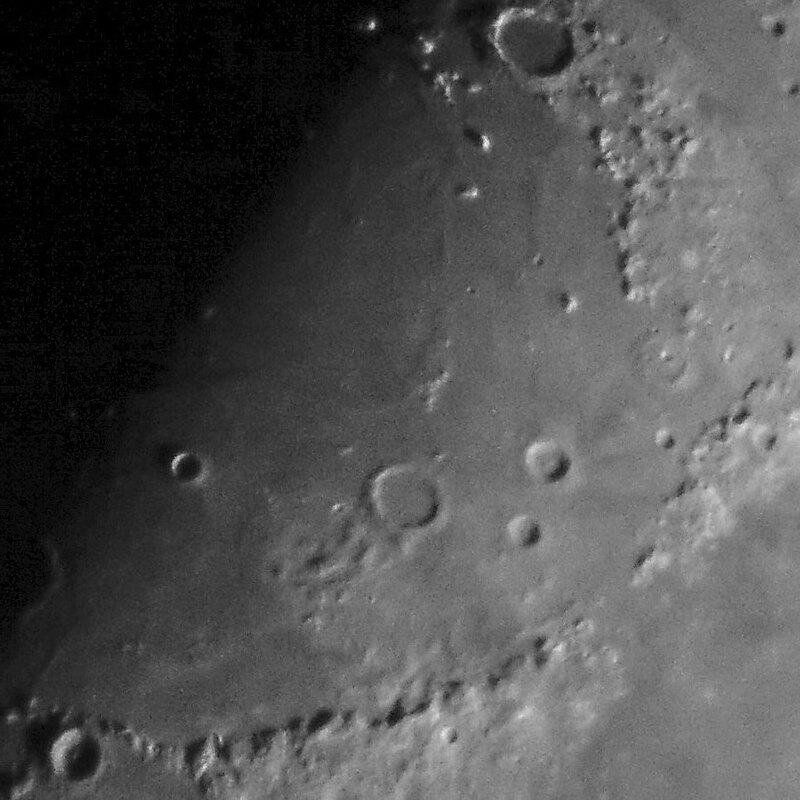 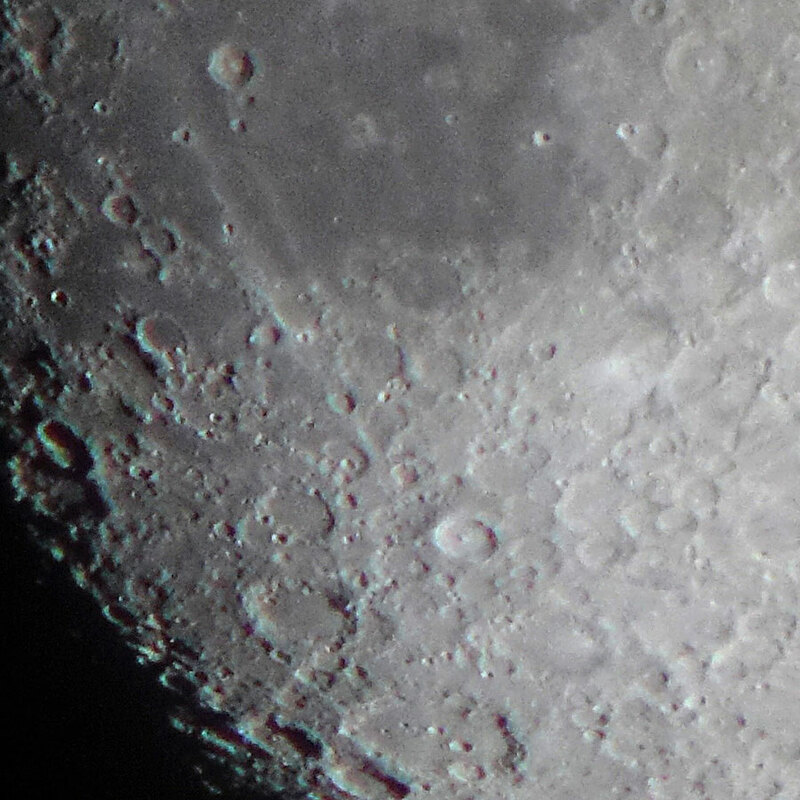 I used my Omegon PS 72/432 refractor and my Sky-Watcher Skymax-127 OTA on the Sky-Watcher AZ Pronto mount. As eyepiece I used my 32 mm DigiScope eyepiece with T-Mount as well as further UWA eyepieces. 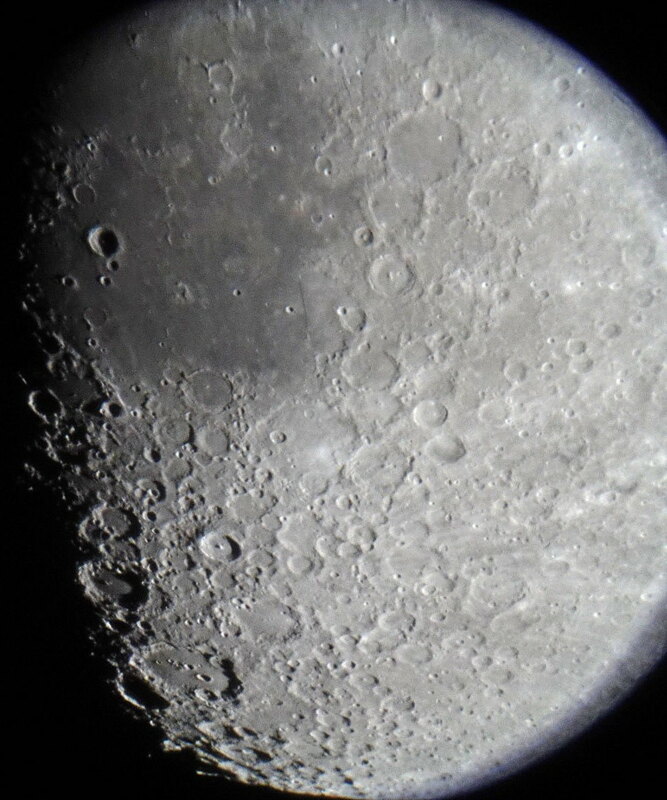 My camera was the Sony RX100 M4, which I screwed firmly to the 32 mm eyepiece (projection method) or held to the eyepiece (1:50 method). 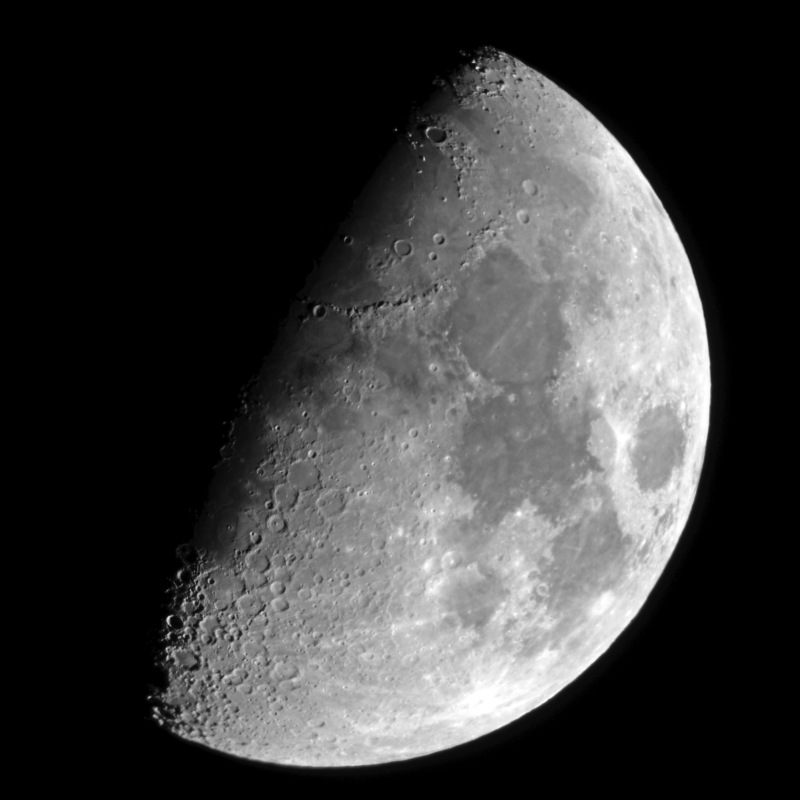 I exposed automatically, manually set the distance to infinity, and adjusted the sharpness with the telescope. 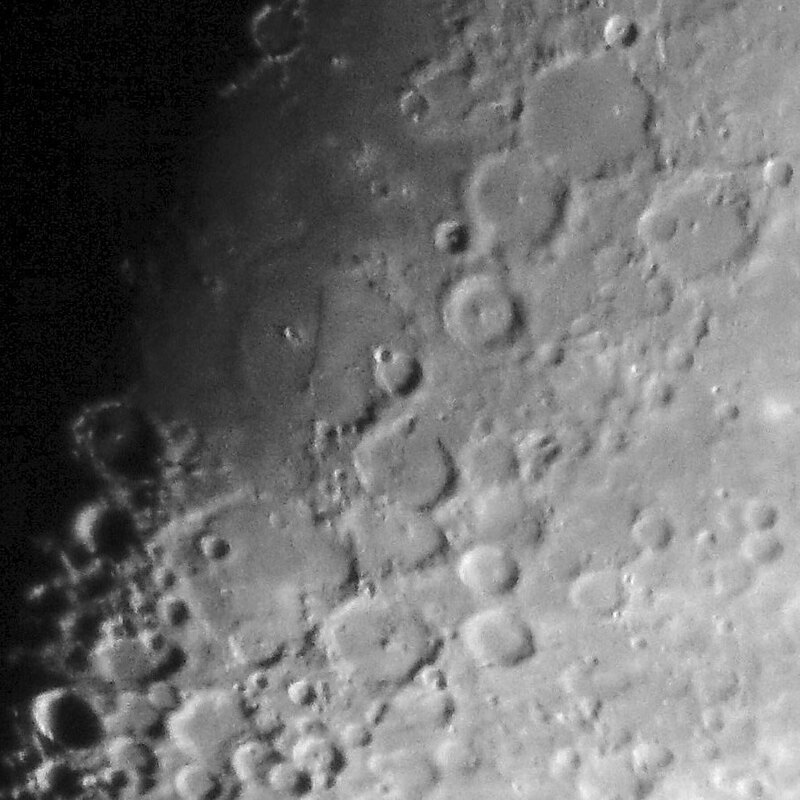 On the one hand I wanted to see what photo quality I would be able to achieve with my equipment, on the other hand I was interested in the difference between the small refractor and the Skymax tube, which at least has almost the double aperture (and therefore, resolution). Note: The following photos are oriented in a way that they correspond to the normal visual impression. 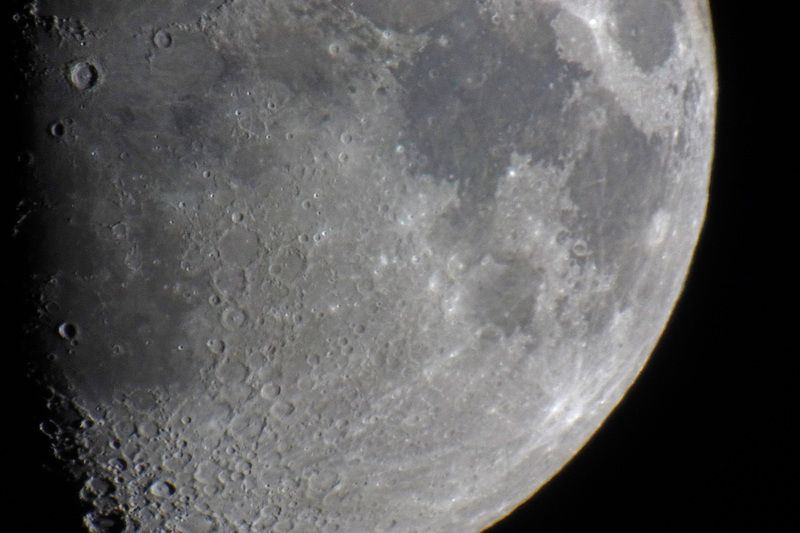 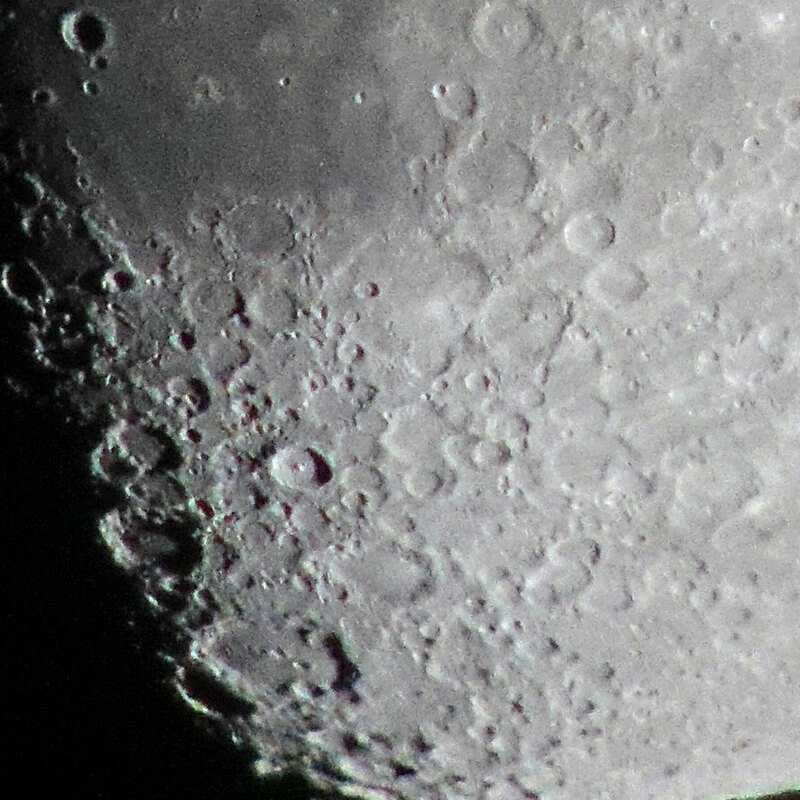 The following photos of the moon were taken on November 16, 2018 with the Omegon PS 72/432 refractor and the Sony RX100 M4 using the 1:50 method at a 7 mm eyepiece (magnification nearly 62 x). 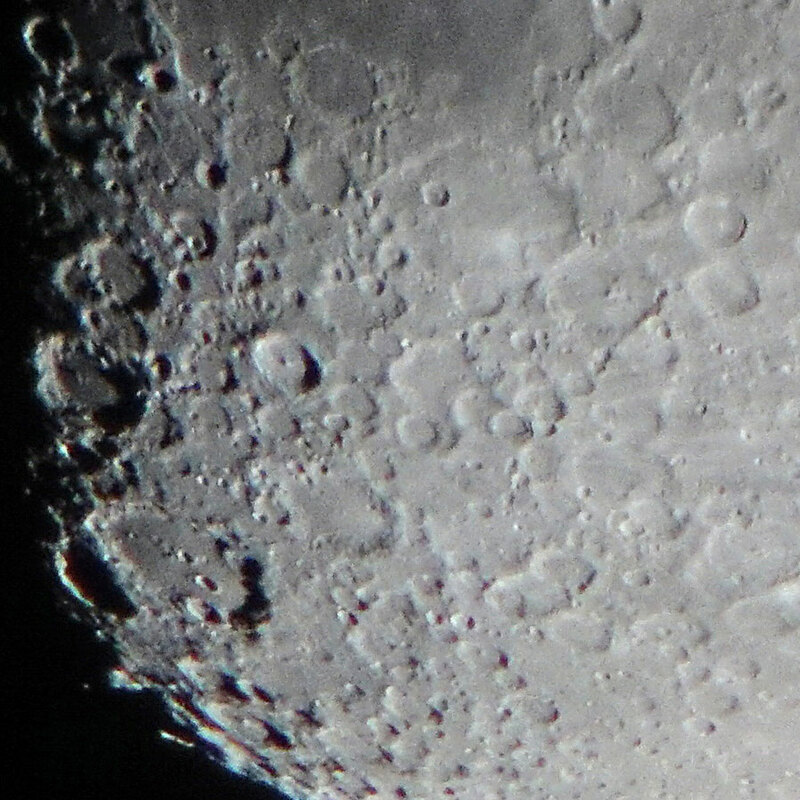 All the photos were cropped to the same size and scaled down. The large versions (links) open in a new window and show the photos in 100% pixel size. Clicking a photo opens this in double size in a new window or tab. 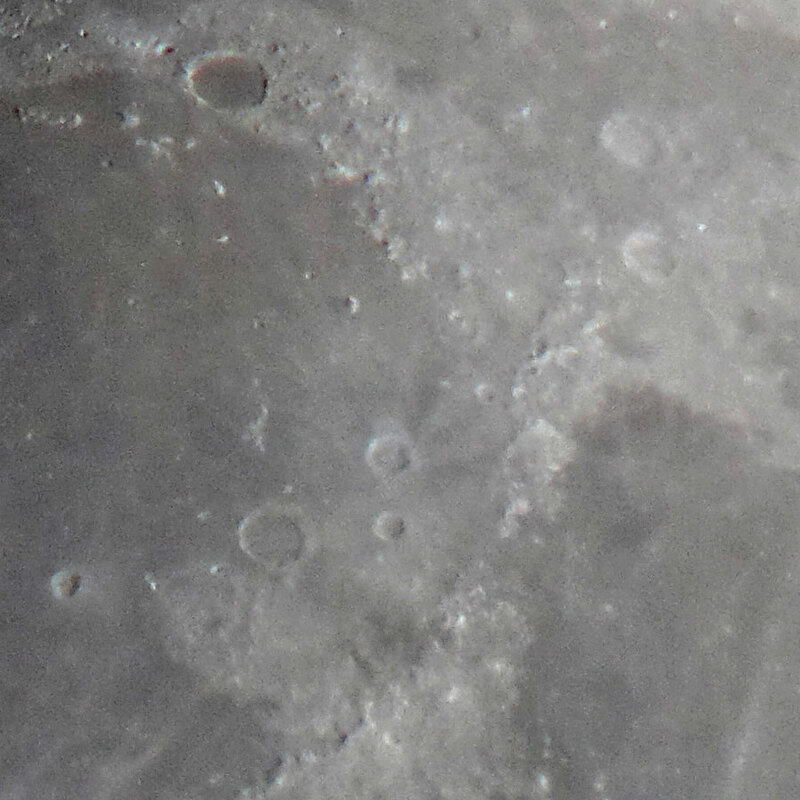 The detail sections were taken from the photos above, cropped to the same size and scaled down. 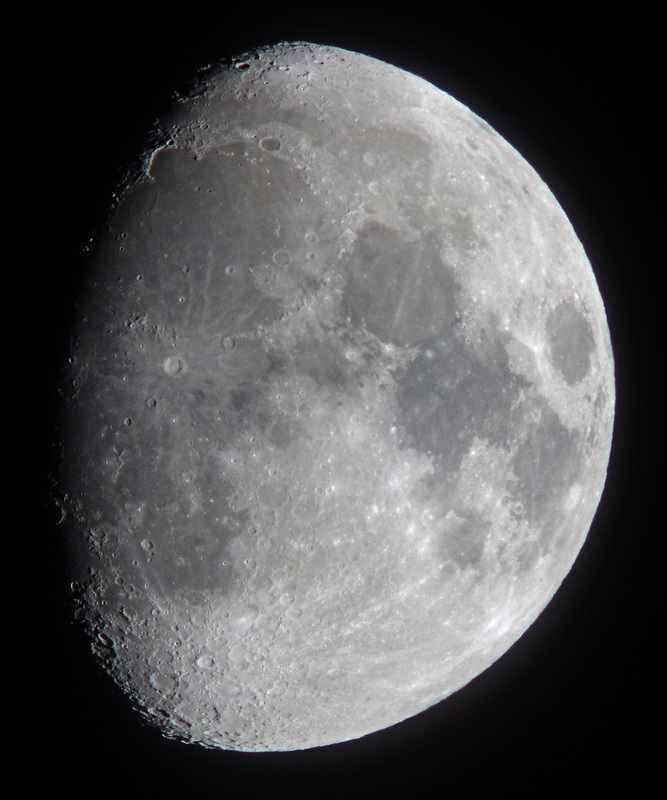 Clicking a photo opens this in double size in a new window or tab (1:1). 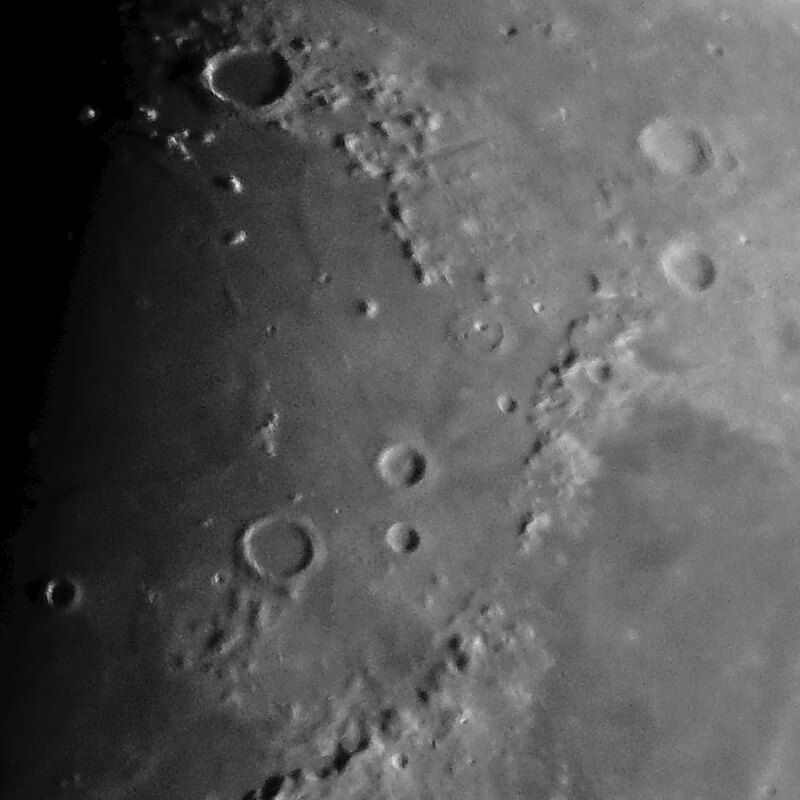 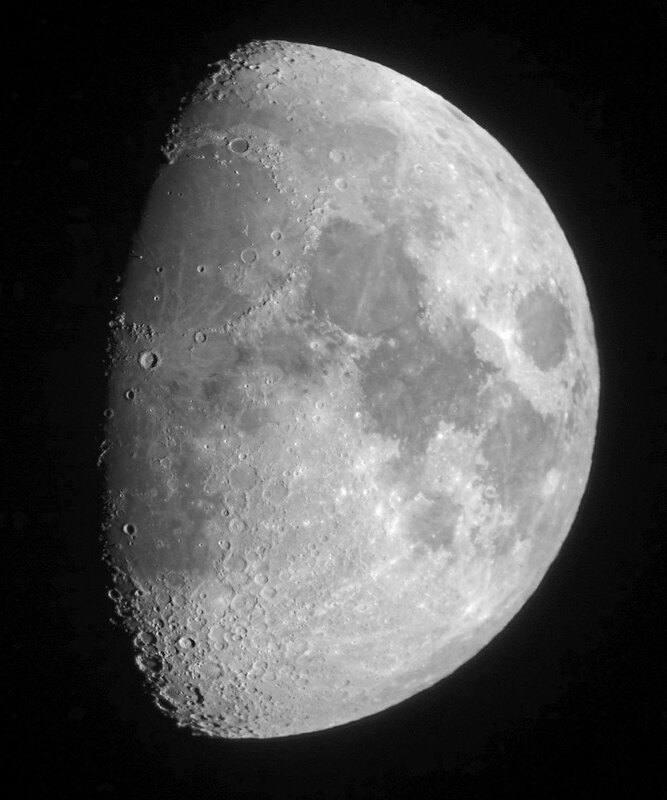 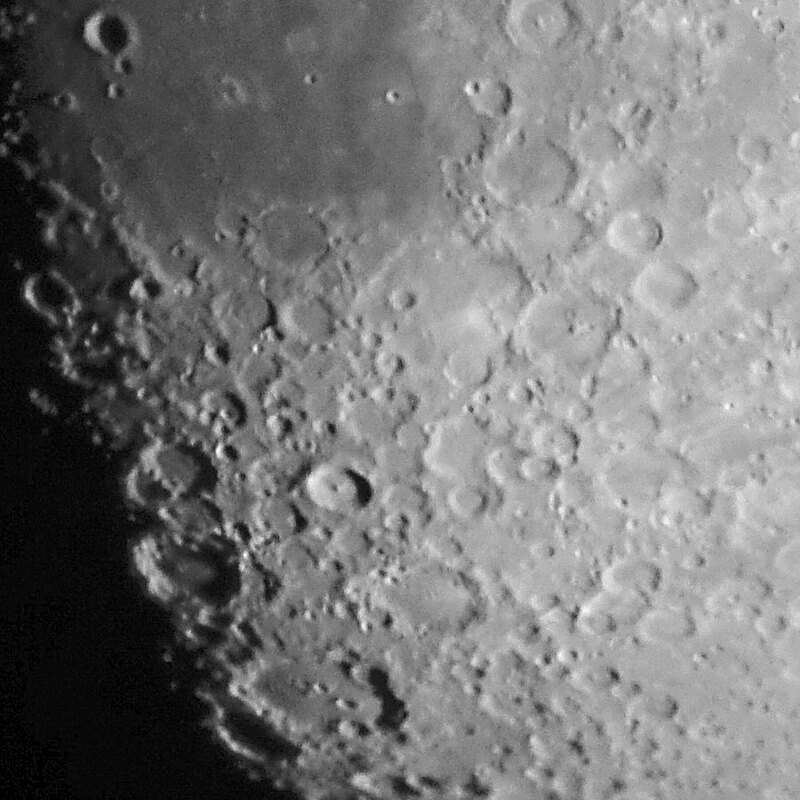 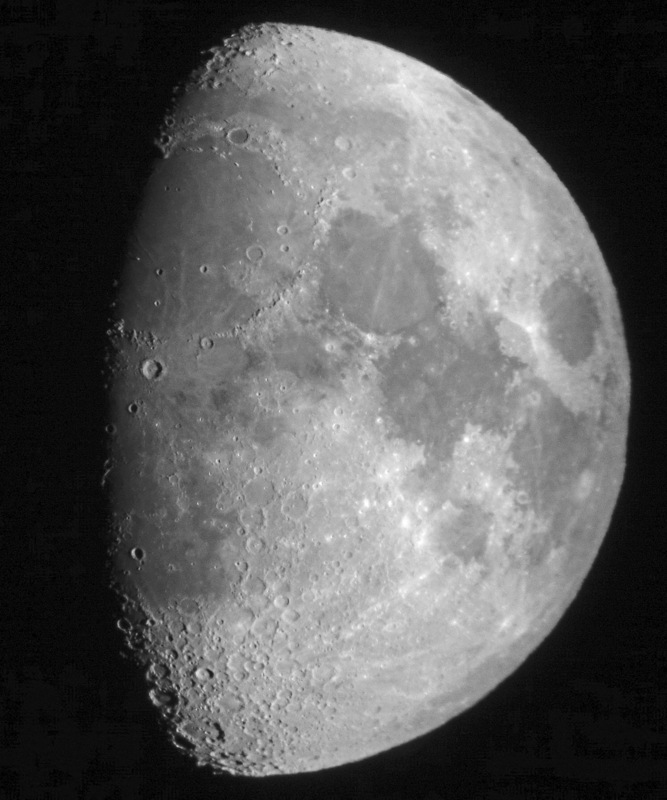 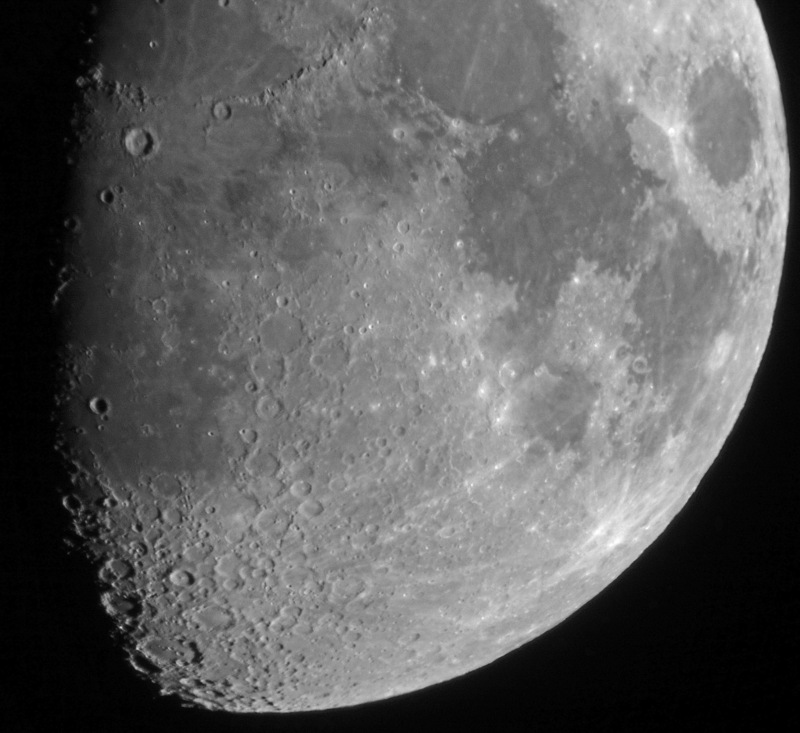 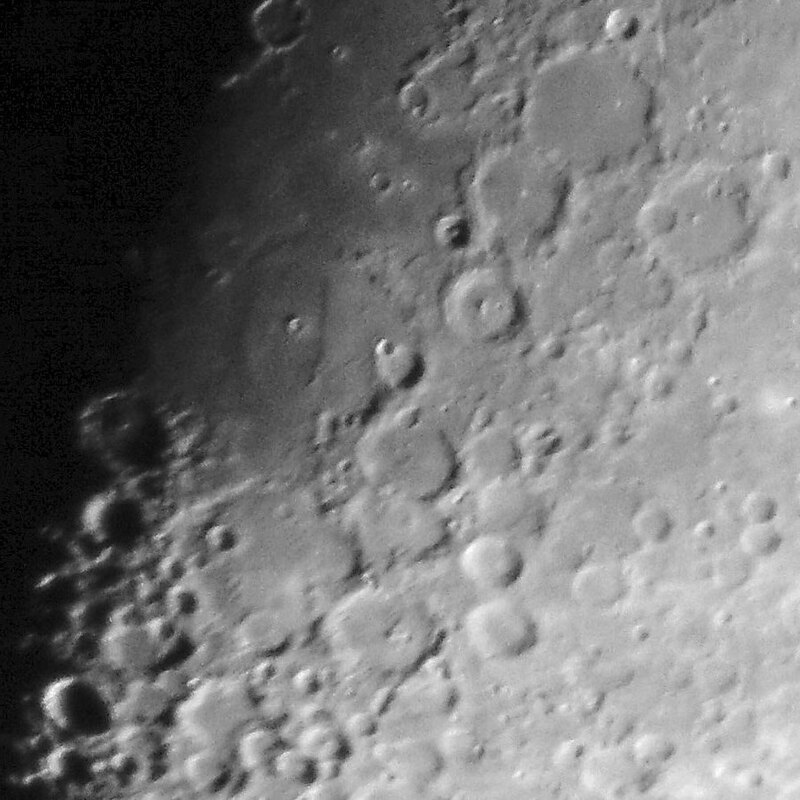 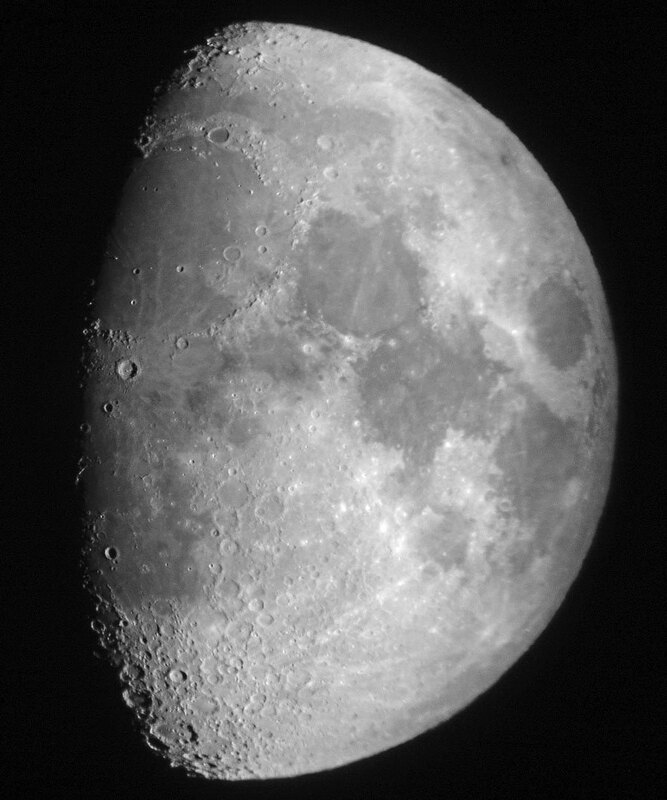 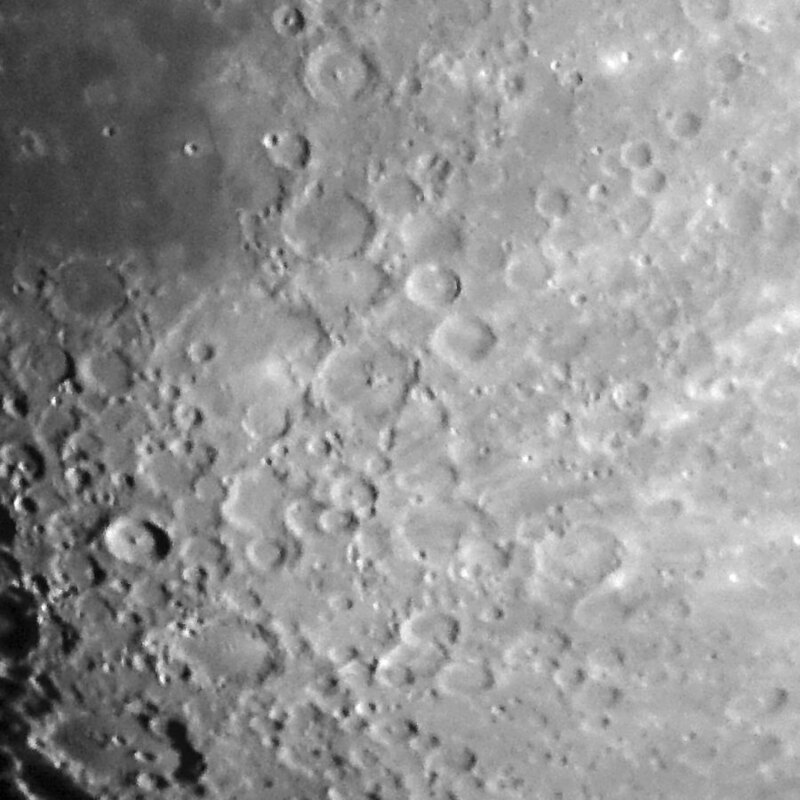 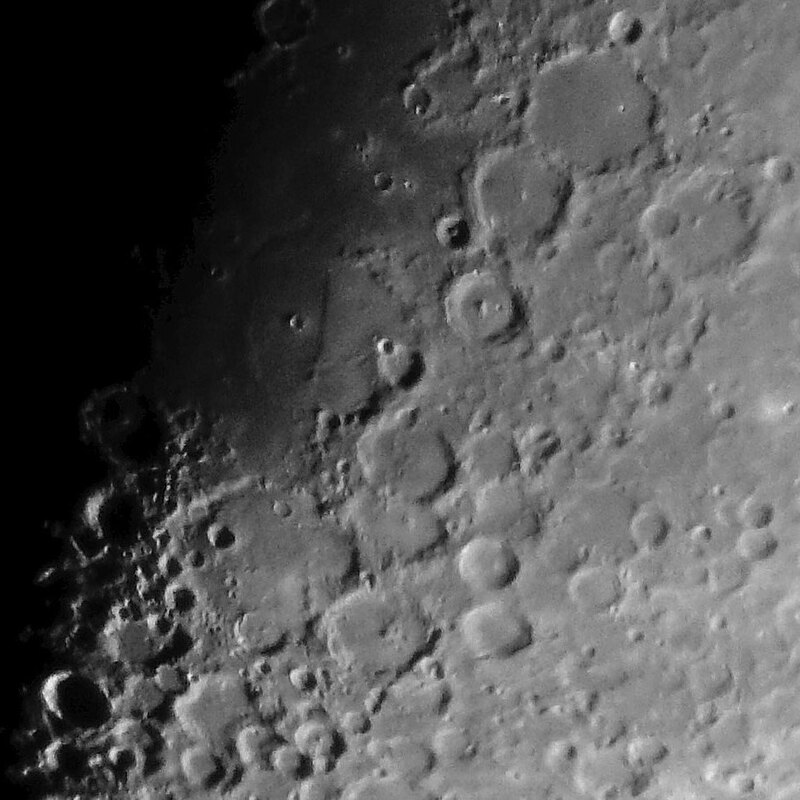 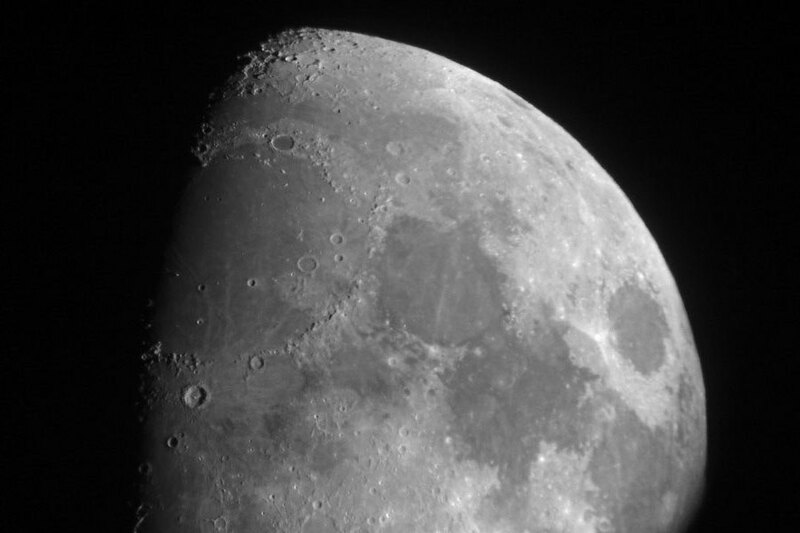 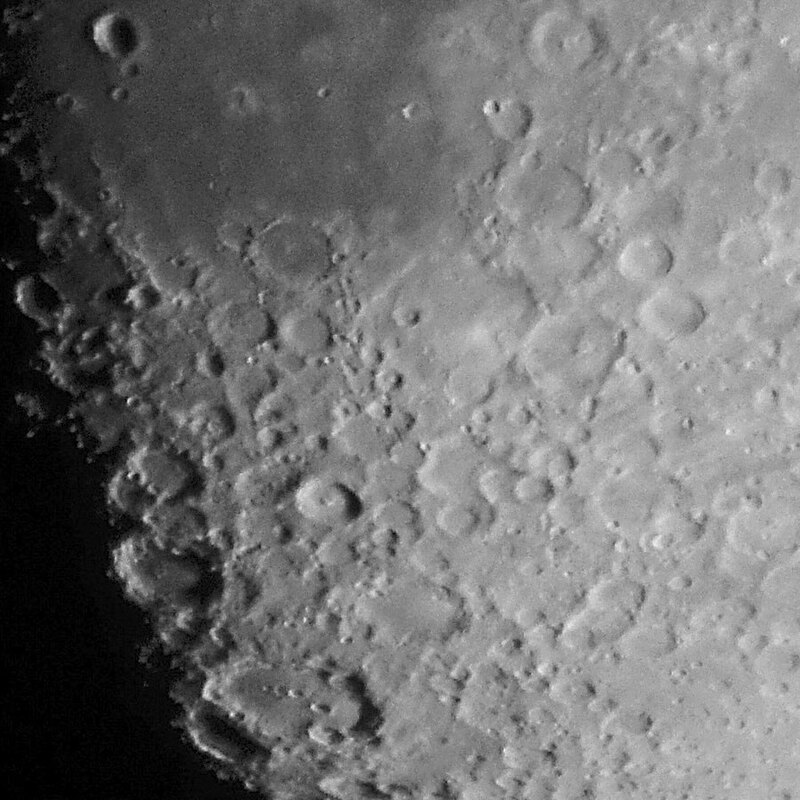 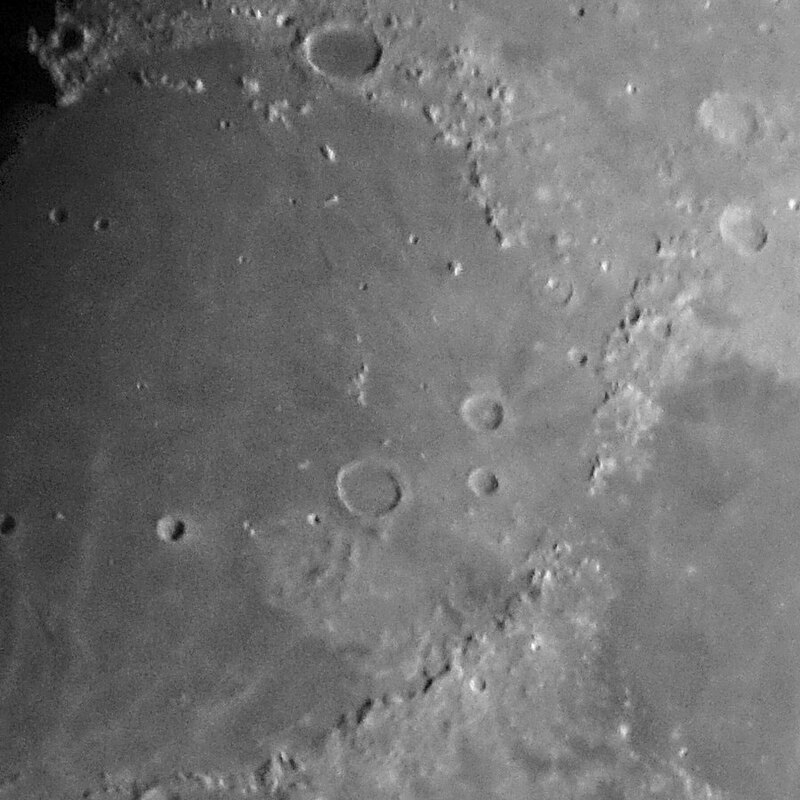 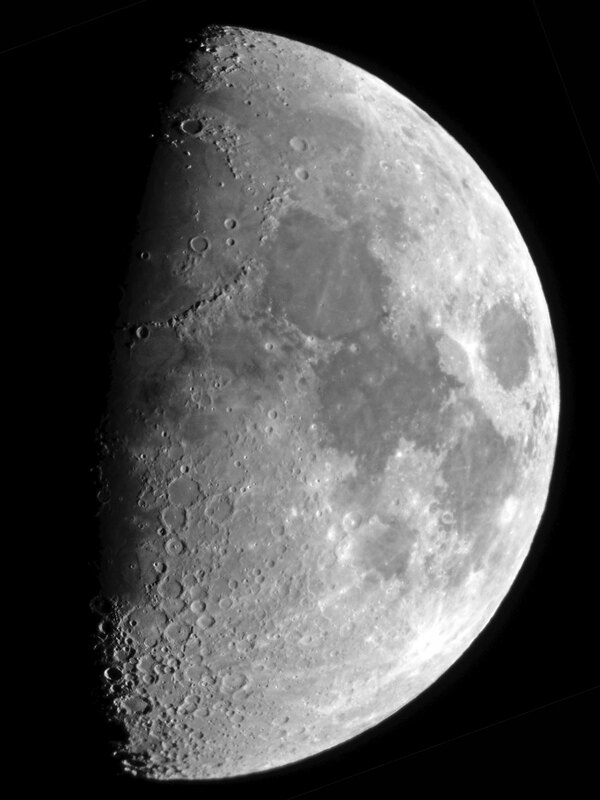 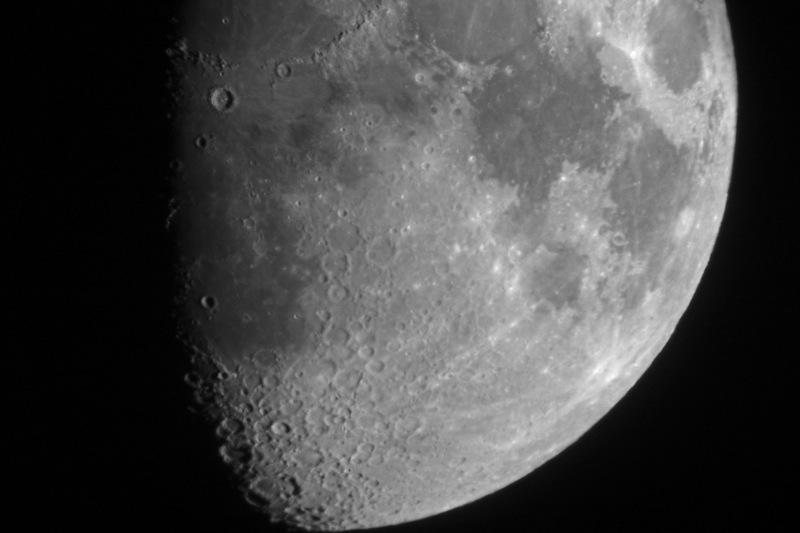 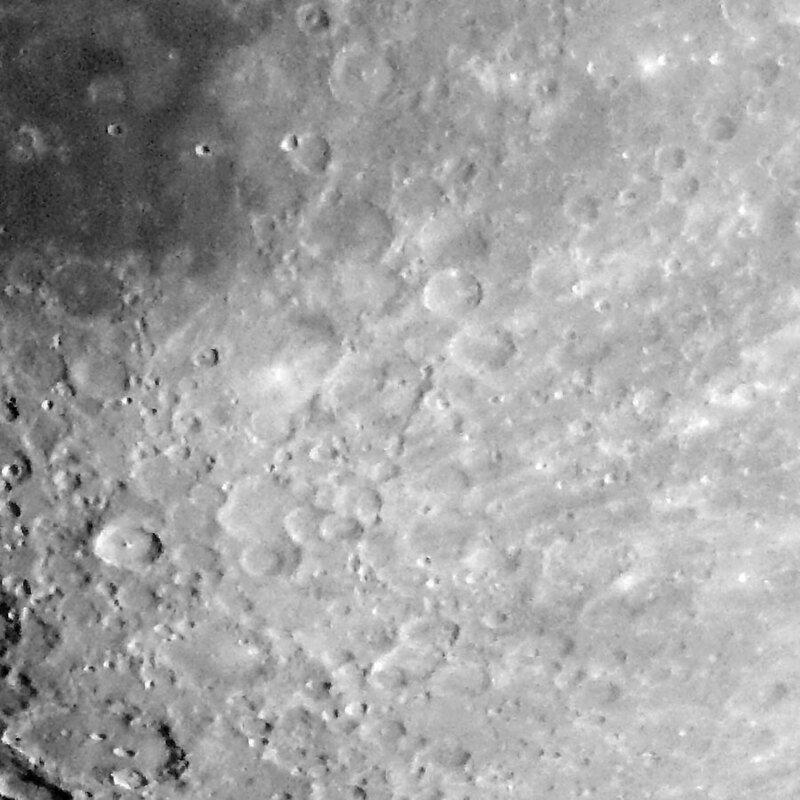 The following photos of the moon were taken on November 17, 2018 with the Omegon PS 72/432 and with the Sky-Watcher Skymax-127 OTA. 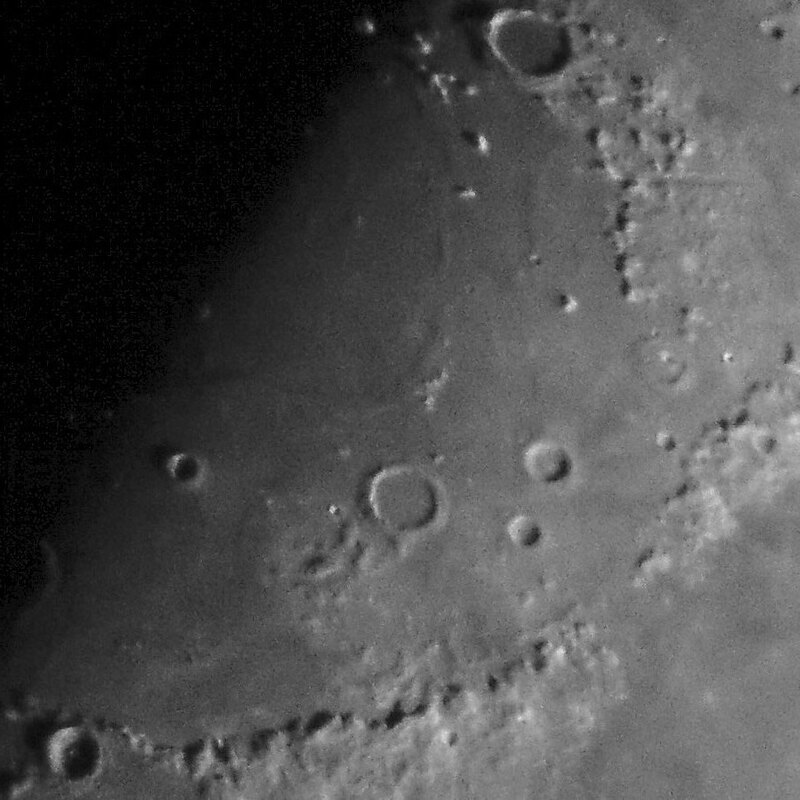 My additional goal here was to compare the Omegon refractor PS 72/432 with the Sky-Watcher Maksutov-Cassegrain tube Skymax-127, although the latter should show much more detail due to its almost twice as large aperture. 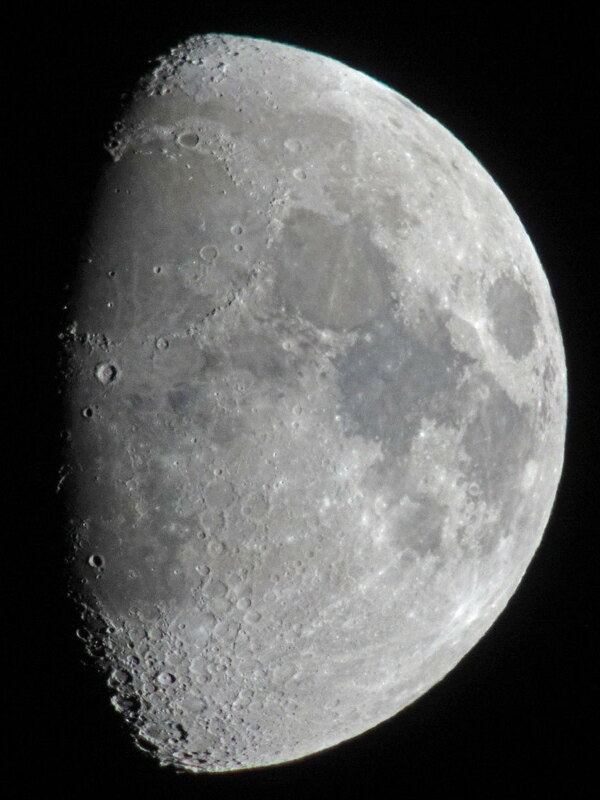 All the photos were cropped and scaled down to a similar size. The large versions (links) open in a new window and demonstrate the different pixel sizes. 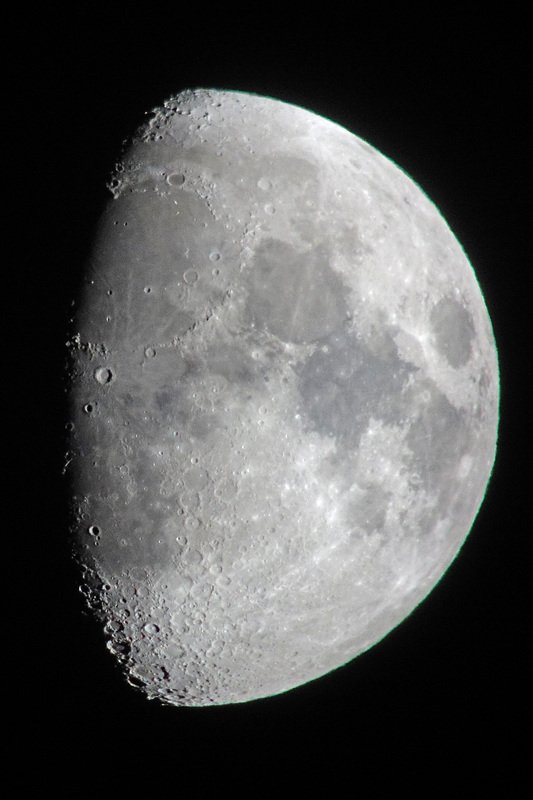 Clicking a photo opens this in double size in a new window or tab. 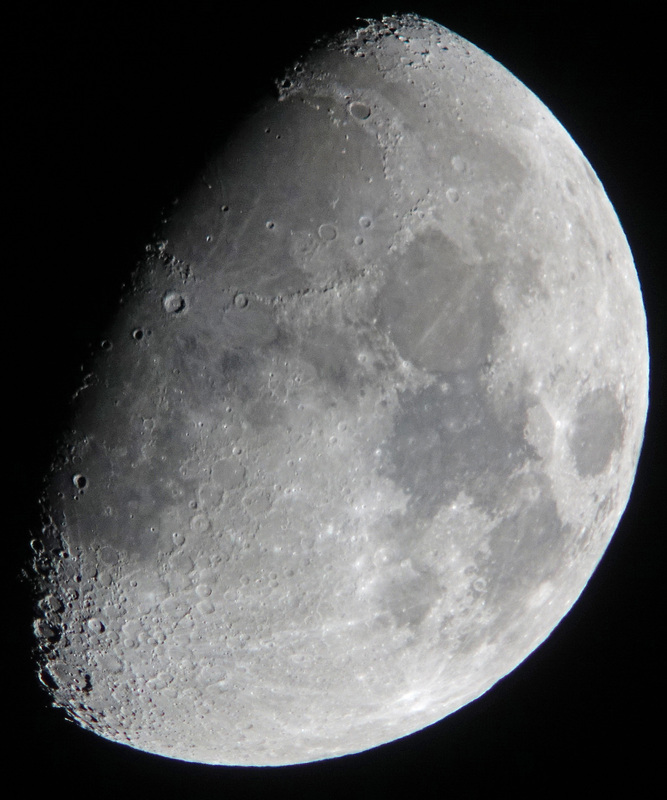 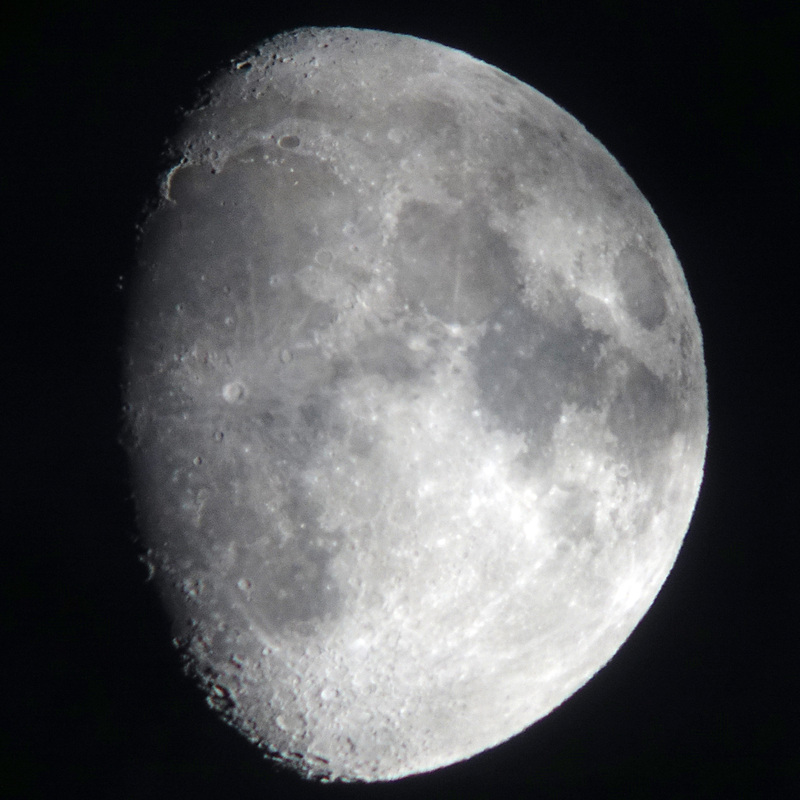 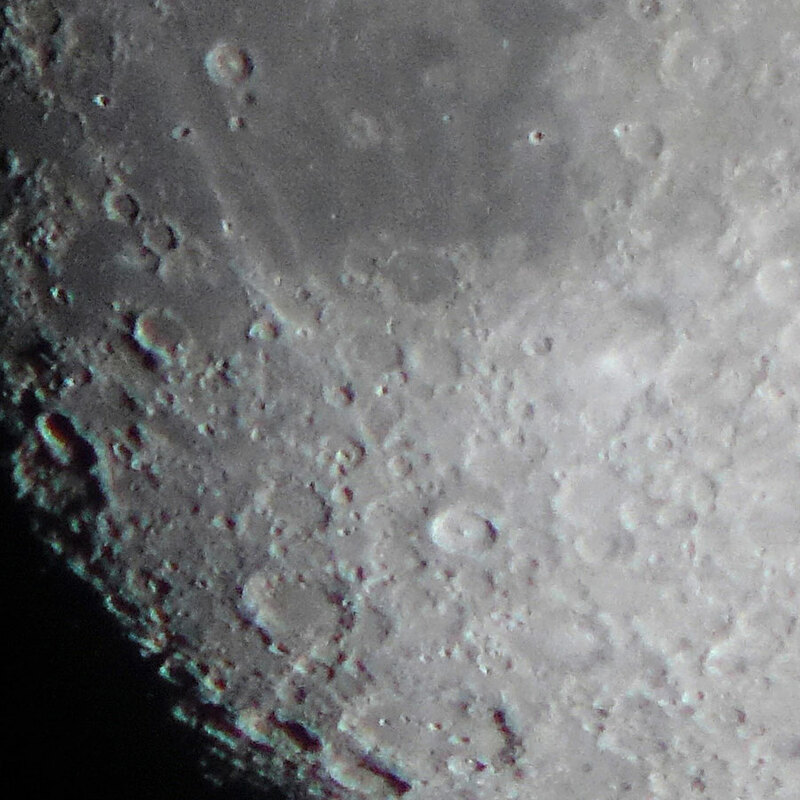 The following photos were taken with the Omegon PS 72/432 refractor and the Sony RX100 M4 camera. The first three photos were taken with the 1:50 method, i.e. 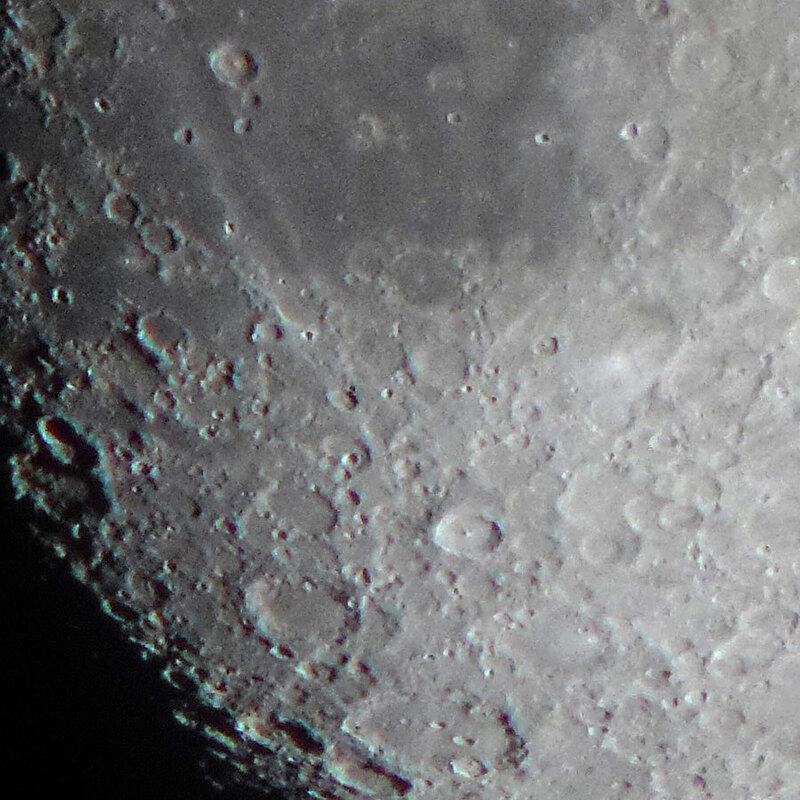 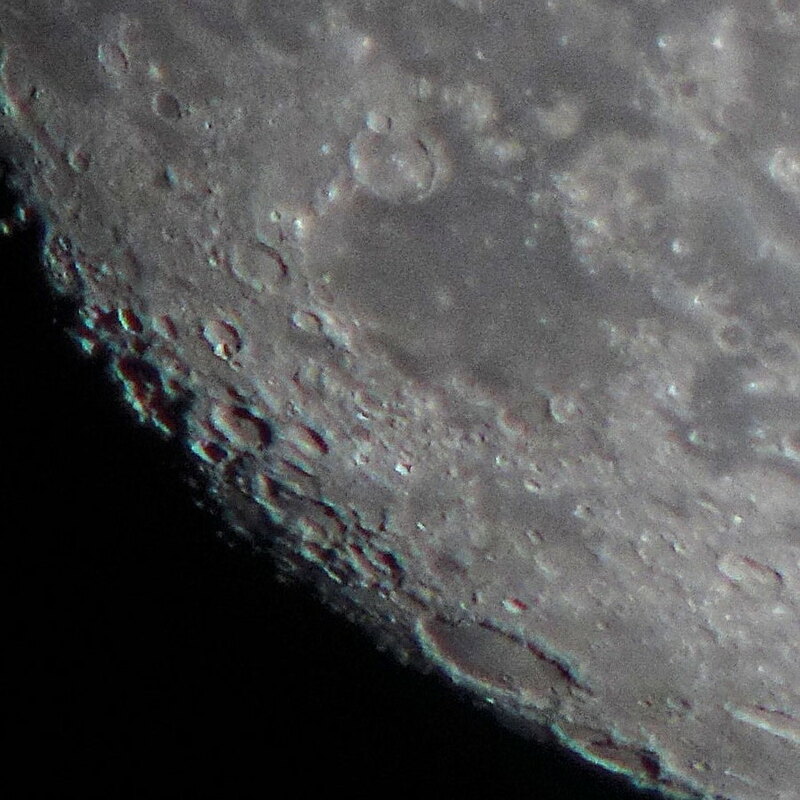 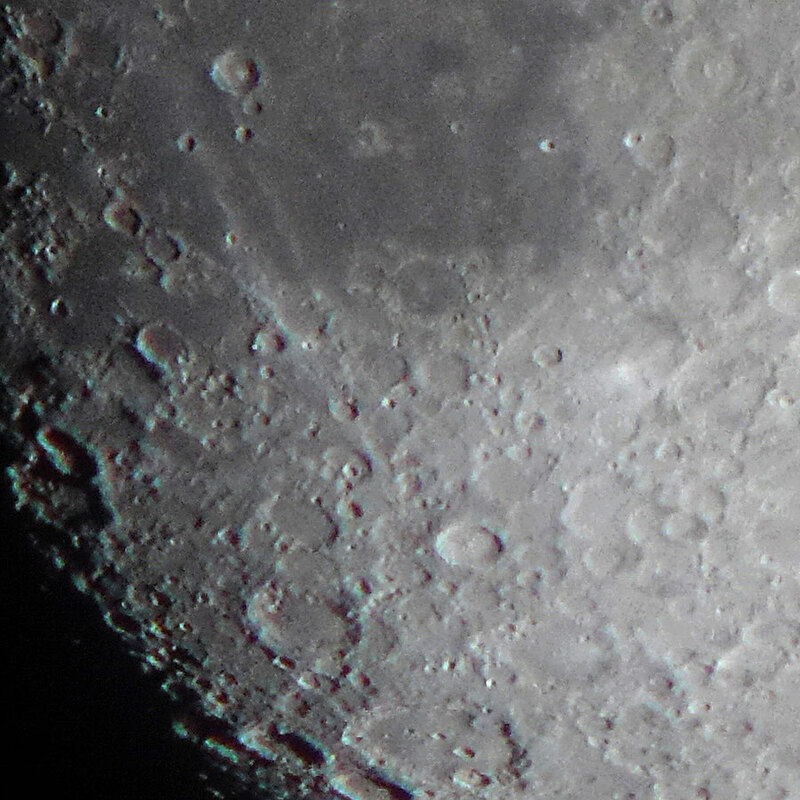 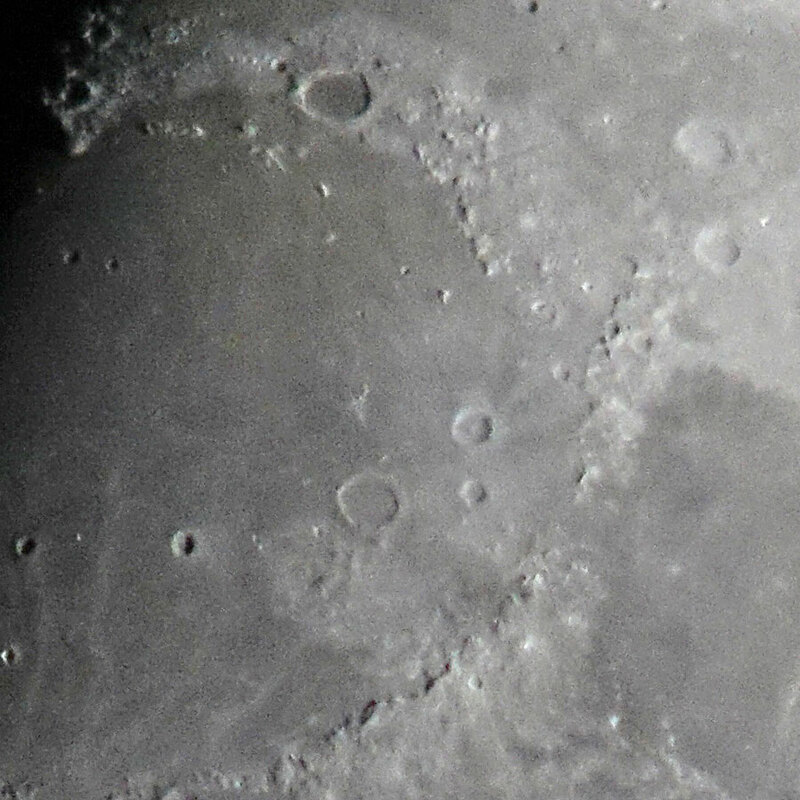 with the camera held to an eyepiece. 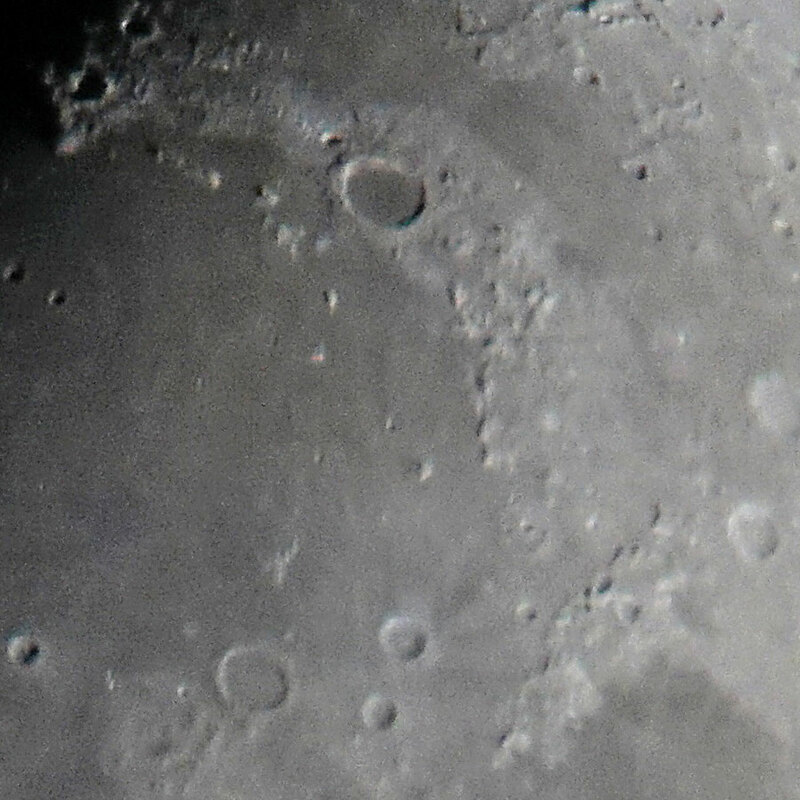 Probably, the 7 mm eyepiece was used (delivering a magnification of almost 62 x). The fourth image was taken with the projection method using my 32 mm eyepiece and a 3 x focal extender (delivering a magnification of 40.5 x). 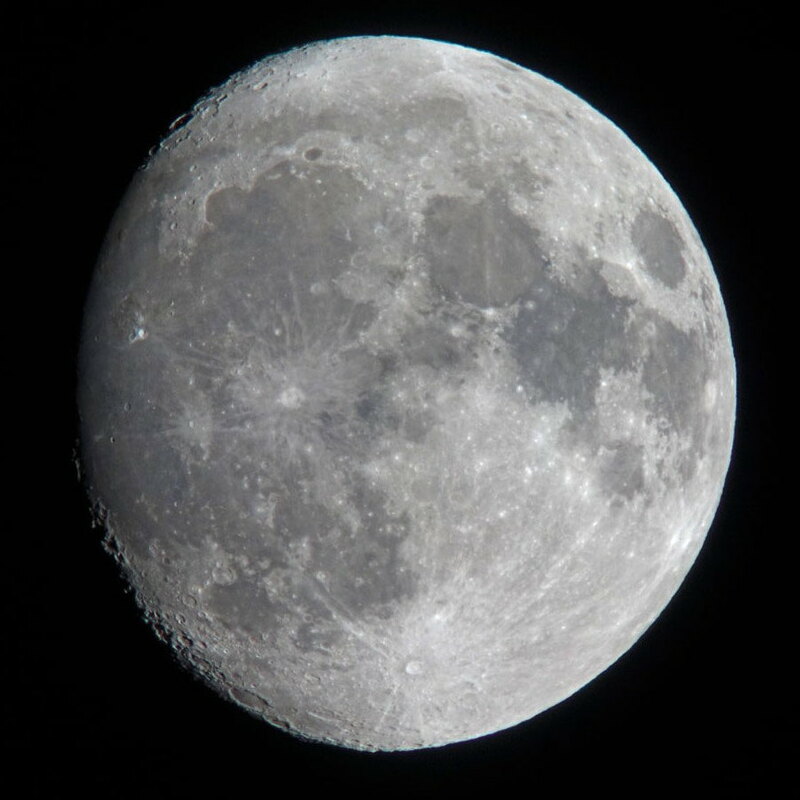 The first four photos were taken with the Sky-Watcher Skymax-127 and the Sony RX100 M4 using the 1:50 method (at different magnifications). 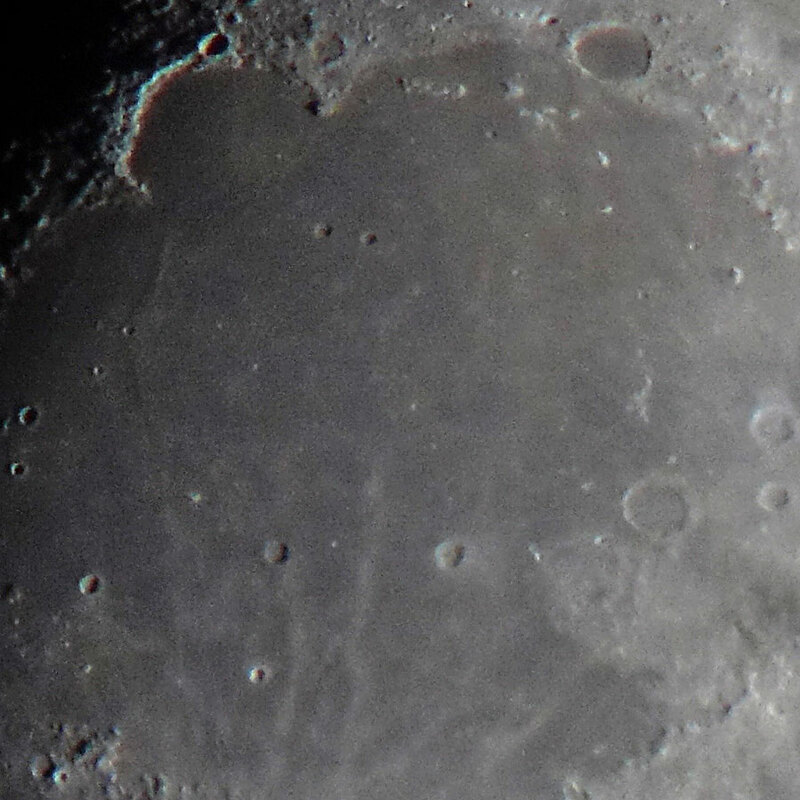 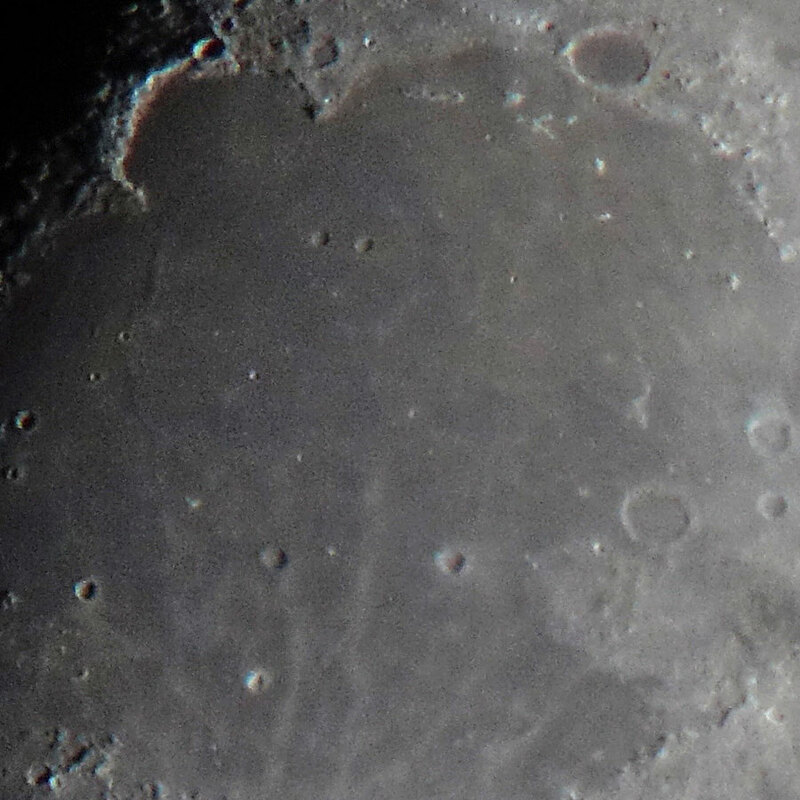 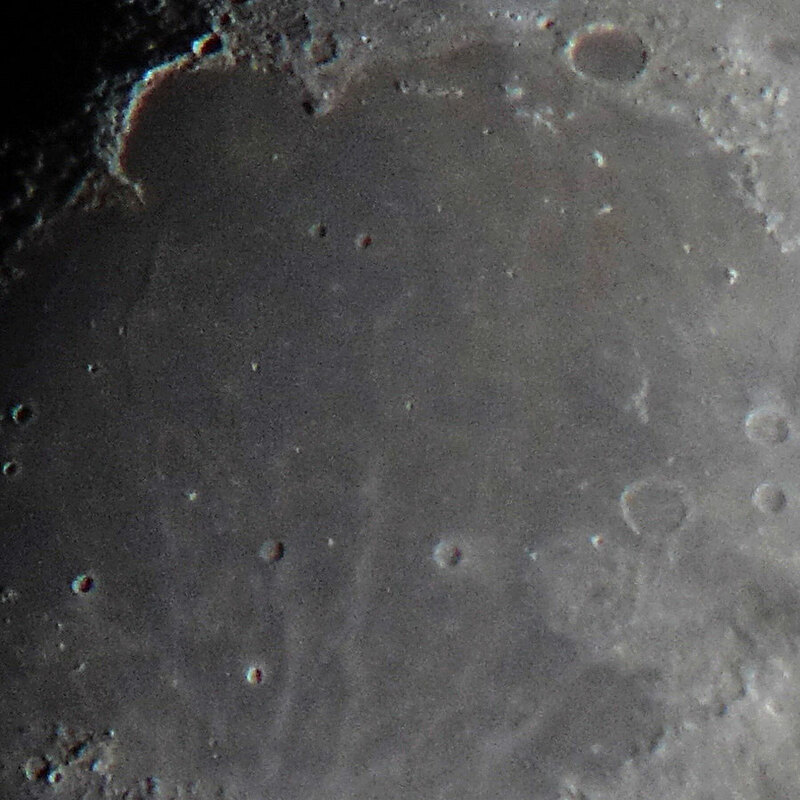 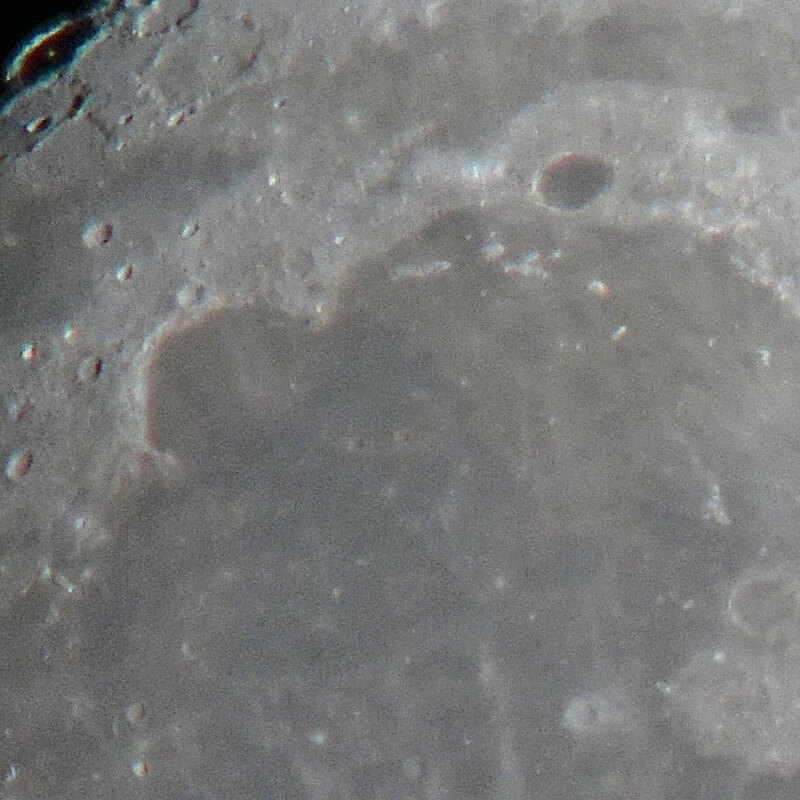 The last photo was taken with the projection method using the 32 mm eyepiece (at a magnification of almost 47 x). The detail sections were taken from some of the photos above, cropped to the same size and scaled down. Clicking a photo opens this in double size in a new window or tab. The following detail photos are photos on their own and not sections derived from the complete moon photos. Clicking a photo opens this in double size in a new window or tab. 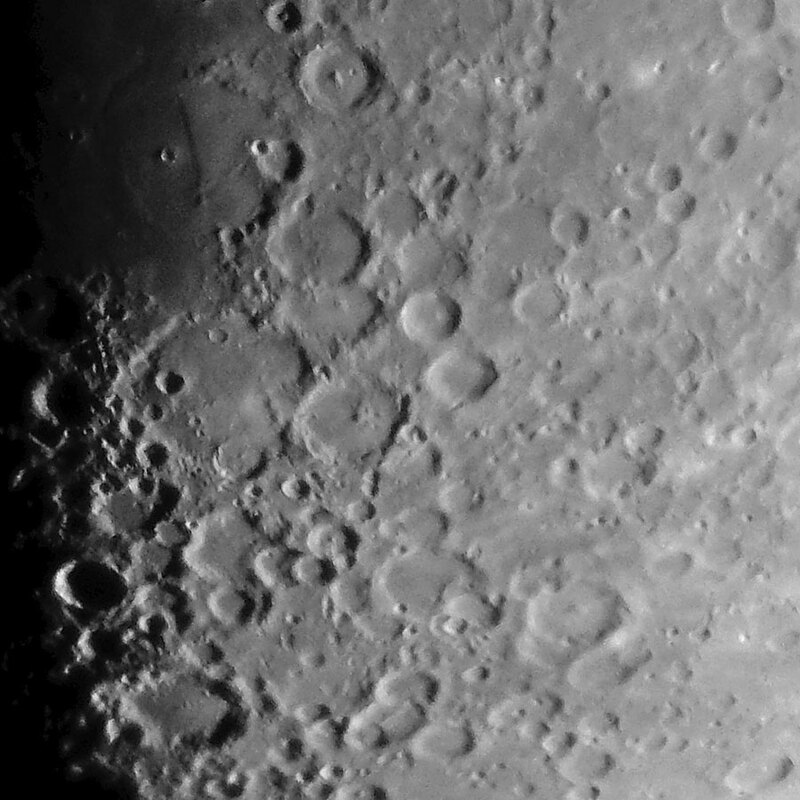 The following photos of the moon were taken on November 18, 2018 with the Omegon PS 72/432 and the Sony RX100 M4 using the projection method and my 32 mm eyepiece with a 3 x focal extender, resulting in a magnification of 40.5 x. 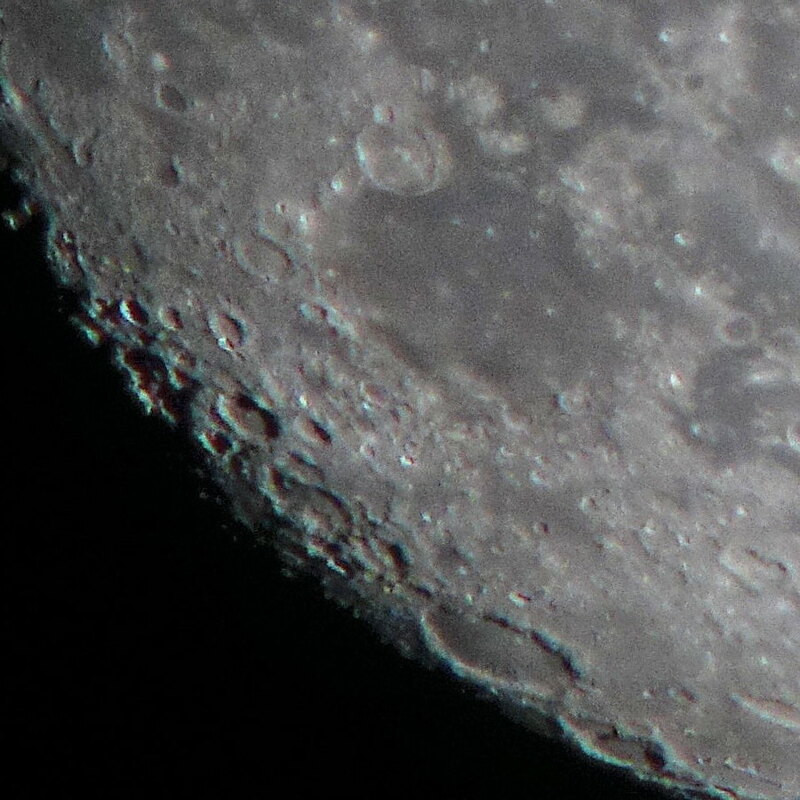 They differ partly in size because I used different focal lengths at the camera. 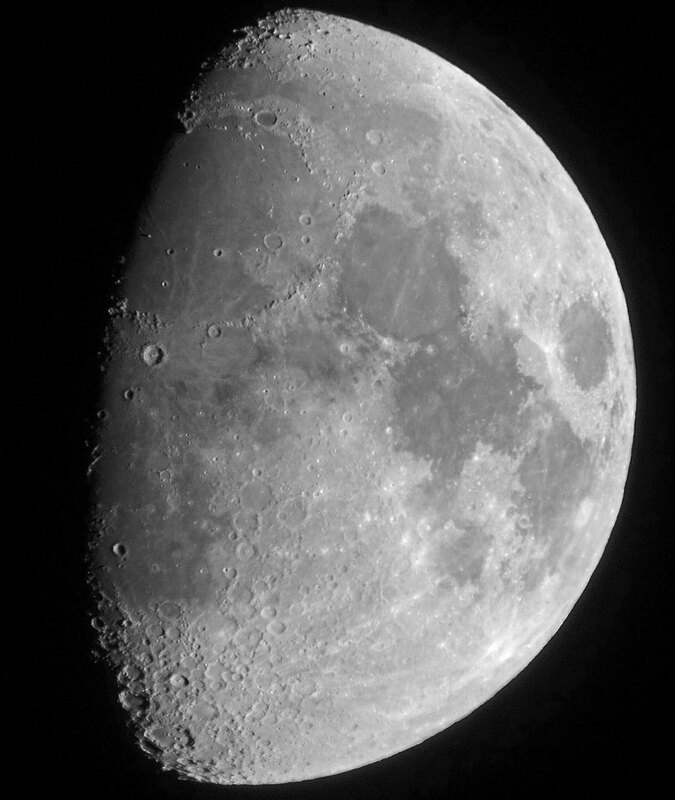 The following photos of the moon were taken on November 20, 2018 with the Omegon PS 72/432 and the Sony RX100 M4 using the projection method and my 32 mm eyepiece with a 3 x focal extender, resulting in a magnification of 40.5 x. 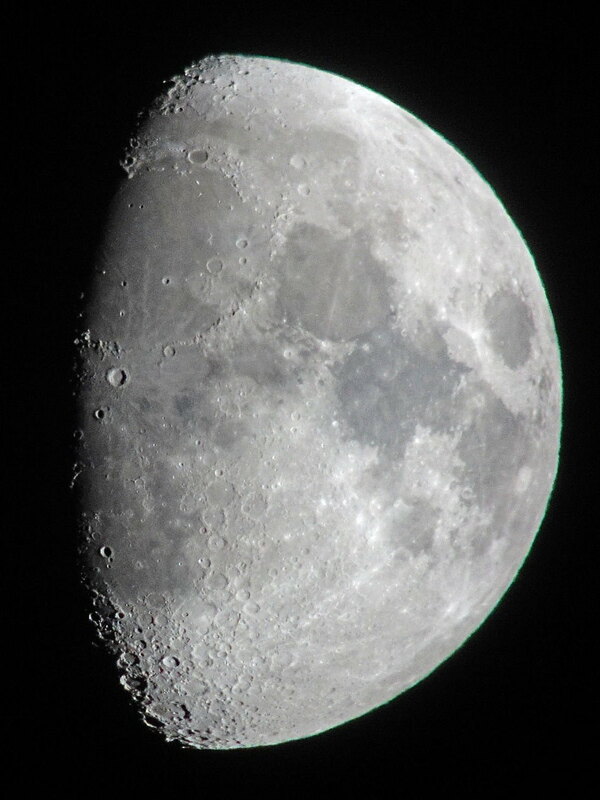 Note: This is the first of three photo series that I shot on that day. 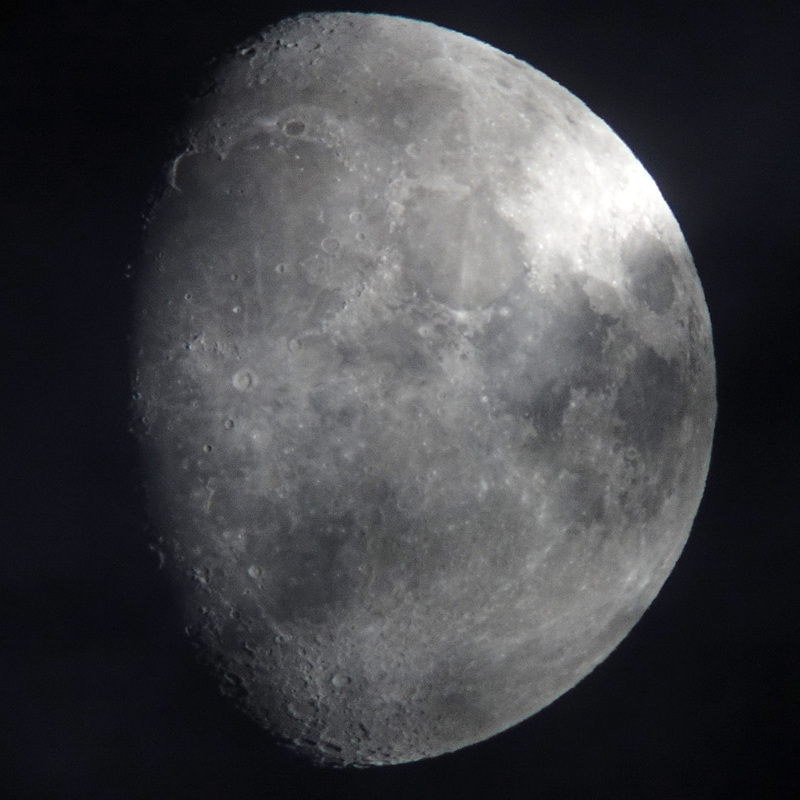 For all three series see page Photos of the Moon November 20, 2018. All the photos were cropped and scaled down tothe same size. The large versions (links) open in a new window and demonstrate the 1:1 look. Clicking a photo opens this in double size in a new window or tab. 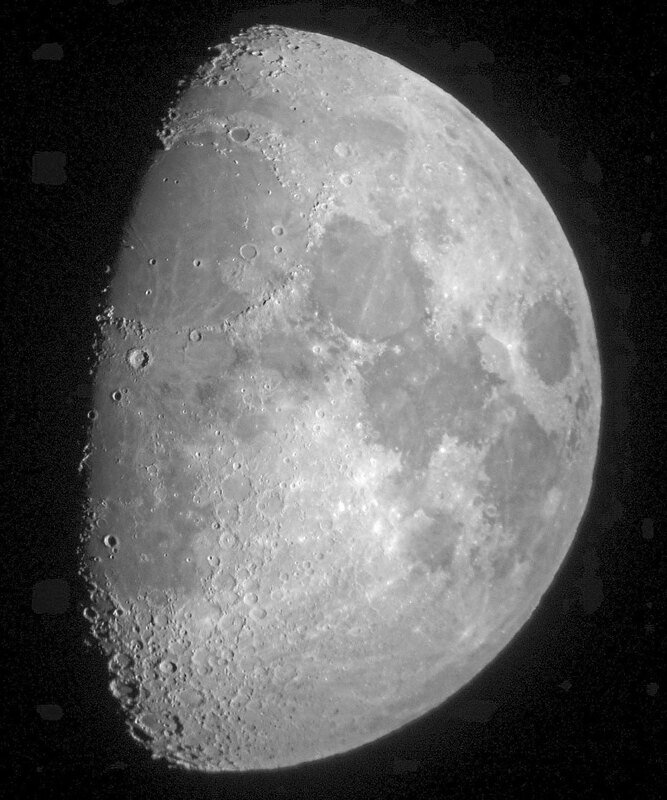 Note how the look (shading) of certain structures changes during the three days because the sun rays hit the moon at different angles and the terminator is moving westwards. 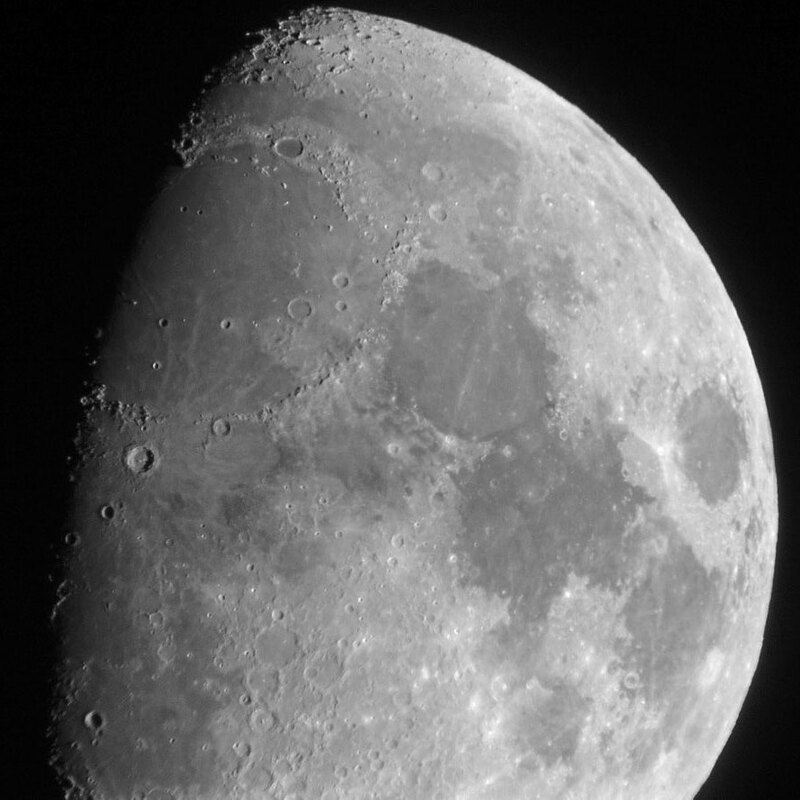 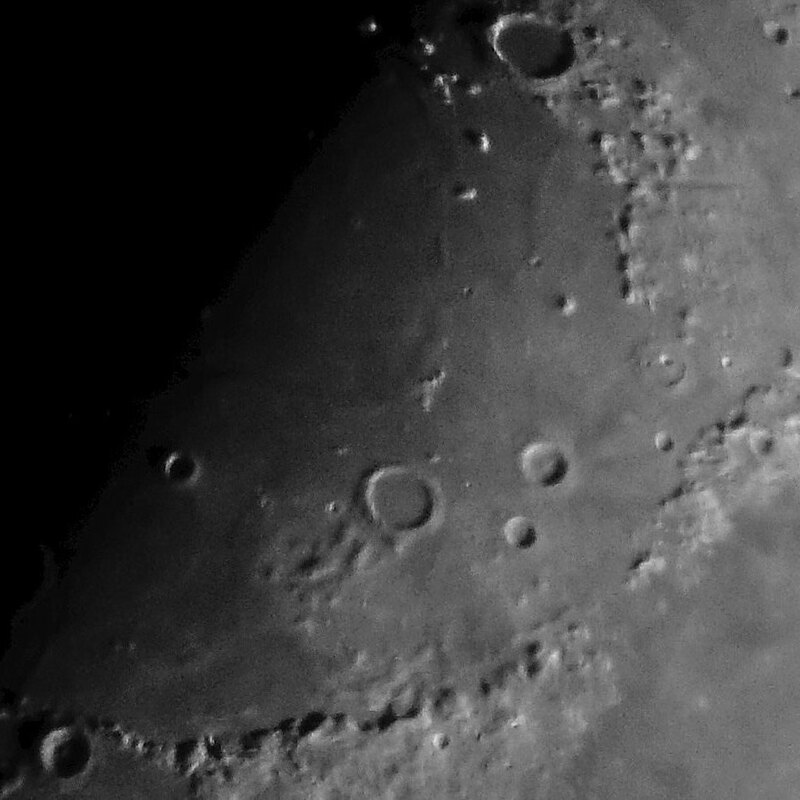 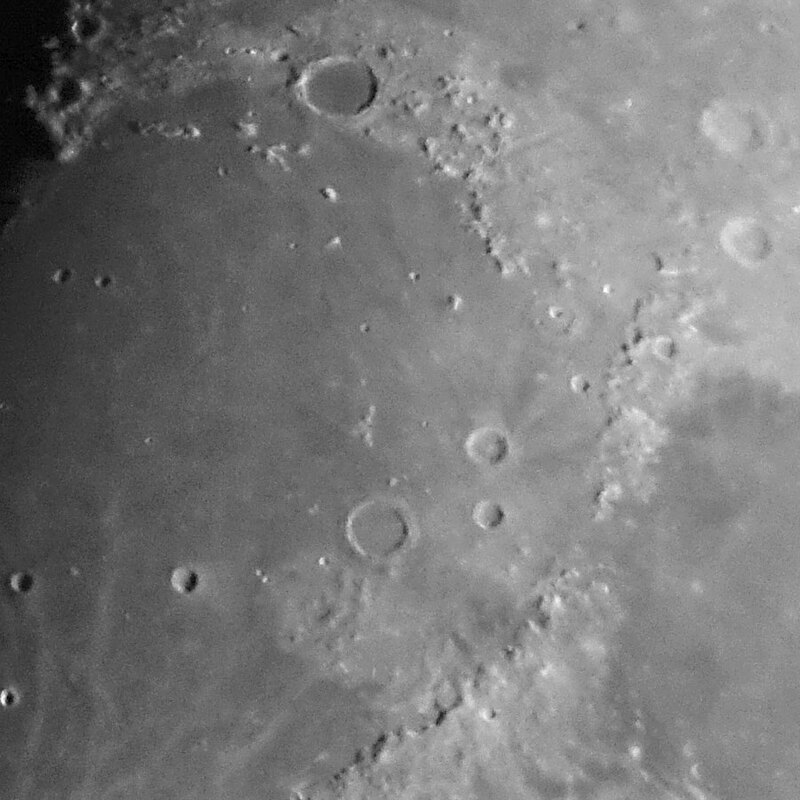 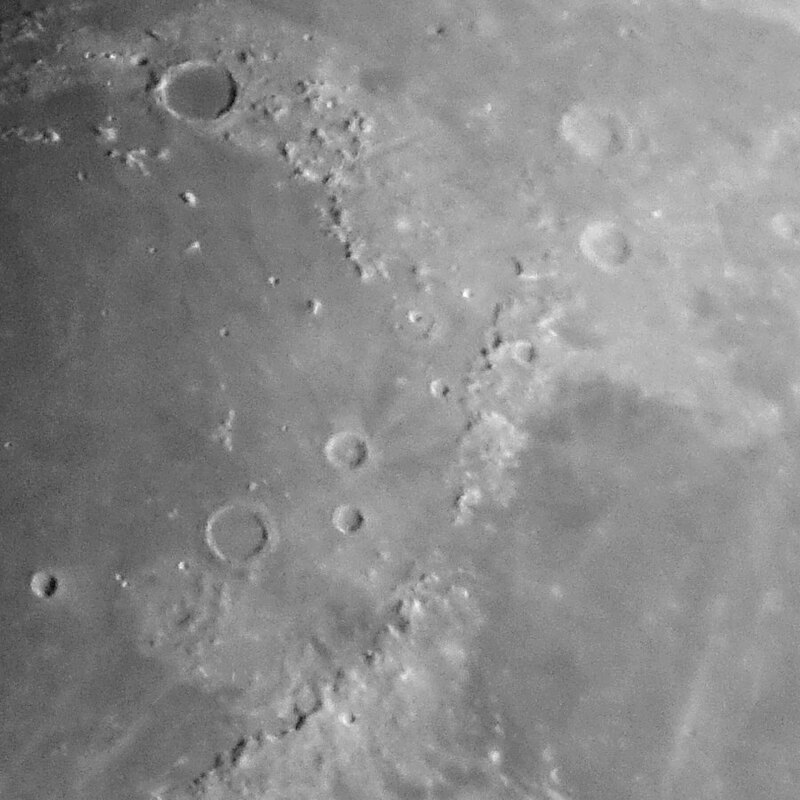 I created these photo series in order to explore, which photo quality can be achieved with my equipment, that is, with my PS 72/432 and Skymax-127 OTA tubes on an AZ Pronto mount, and with a Sony RX100 M4 camera, which was, at least in part, attached to a 32 mm eyepiece with a T-mount and was triggered with a wired remote control. On the other hand, I was also interested in finding out how pronounced the differences between my refractor and the Skymax-127 are. The first point is demonstrated by the photos on this page, which anyone can download if interested. I took a lot more photos than I present here, but, of course, I had to make a selection. 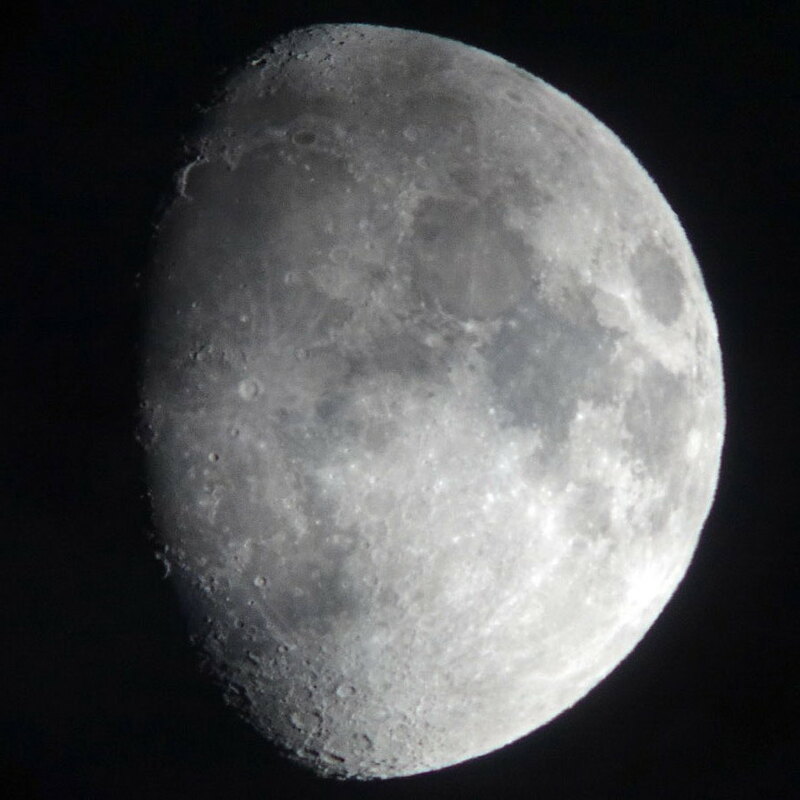 Often, it seemed arbitrary to me which photo I should present here, because one thing was better depicted on one photo and the other thing better on another photo. All in all, a comparison of the many photos showed that air turbulence plays or, at least, can play an important role in my shots. 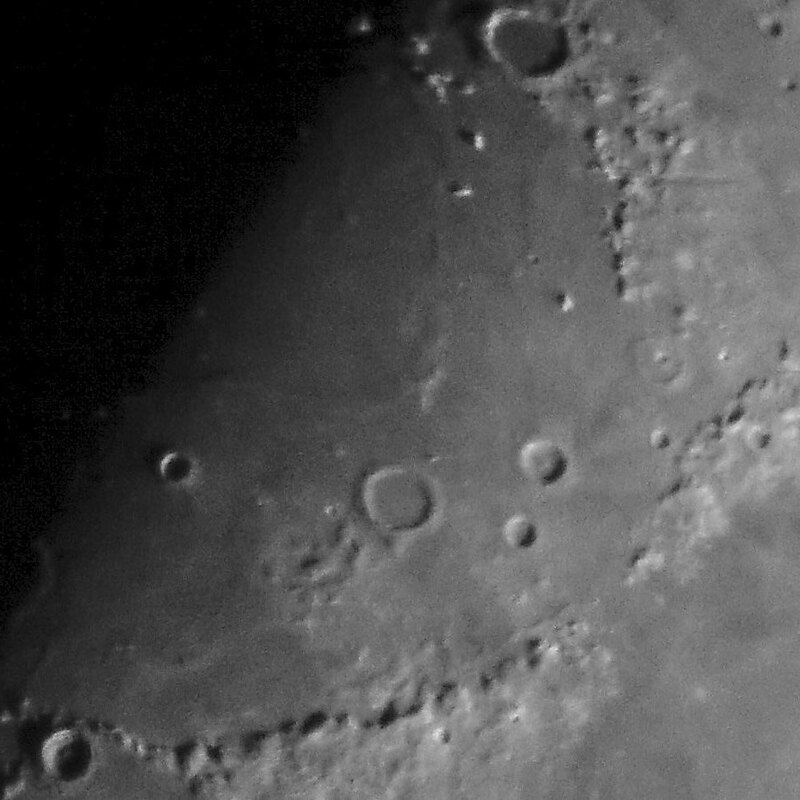 Sometimes, the turbulences distort certain structures, especially when you look at the photos in quick succession, sometimes it makes small structures disappear completely.